Photo: Elvy holds her can that she gets every month containing 300 IND issued joints. Living in Florida, Elvy Musikka bought the Reefer Madness story, hook, line and sinker. As her already bad eyesight continued to deteriorate, she endured prescription pharmaceutical drugs which had uncomfortable side effects, but little effect on her glaucoma. Turning to ever more desperate measures, Elvy agreed to undergo a risky surgery on her better, right eye. The operation left her blinded in that eye. Only then did she consider suggestions to try using marijuana to reduce the buildup of inner eye pressure. To her grudging surprise, she found that it seemed to work. Elvy discussed the effect with her doctor, and did her own experiments by eating marijuana brownies before certain visits to the doctor. His measurements of her eye pressure verified that the herb did, indeed, have the effect of lowering the pressure. Elvy began to grow her own plants and found that she was good at it; good enough to attract the attention of the police, who arrested her. She argued medical necessity and the judge agreed to hear the testimony. At this point Elvy learned that the doctors had never recorded her observations about marijuana, leaving her to rely on the testimony of expert witnesses and her new physician, who agreed that nothing else had been effective and that marijuana made a measurable difference in her eye pressure. The judge ruled in her favor, stating that Elvy "would have to be insane" to forego the use of medical marijuana. 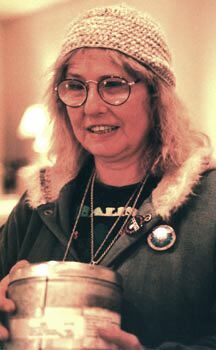 She was placed on the federal IND program, which provided legal marijuana for a few patients until it was shut down under the Bush administration in 1992. Elvy continues to receive government prepared marijuana cigarettes each month. Even though they are not as good as the medicine she grew herself, Elvy's vision has improved due to her steady use of marijuana. Said Elvy, "How can I have a right to medicine but other patients not have the same right? I didn't lose my eyesight to glaucoma, I lost it to ignorance." Elvy is now an ardent and inspiring spokesperson for cannabis reform.